Located on the quiet side of Door County between Baileys Harbor and Sister Bay, our farm market is a “must stop” for all Door County visitors. We are the oldest farm market in Door County and the recipes used to make our jams, jellies and canned goods date back even earlier than the year we opened for business in 1958. Our market includes home-made jams, jellies, fruit butters and canned goods, as well as fresh bakery items, meats, smoked fish, cheeses, fresh vegetables & fruits, Door County wines and Door County wood fire cooked maple syrups. You name it; we have it at Koepsel’s Farm Market. Our selection and variety of items available for purchase is incredible and now you can purchase some of these items year round via our online store. 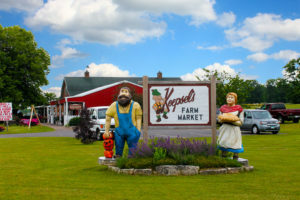 Our market is easy to get to, just watch for the signs along Hwy 57 on your way up to Sister Bay and Northern Door County. Click here for directions & map. There is plenty of parking on both sides of the market. Our market has lots of space and is easy to walk through. Like to bar-b-que? No back yard enthusiast should be with out some of our cherry BBQ sauce, which is amazing on baby back ribs or chicken. Our cherry honey mustard is great on brats or hamburgers and our cherry salsa is a year round treat. Our canned goods selection is bountiful. Everything from canned pickles, sauerkraut, asparagus, beets, dilly beans, applesauce and corn relish to our pie fillings. Our products are made from only the freshest ingredients. 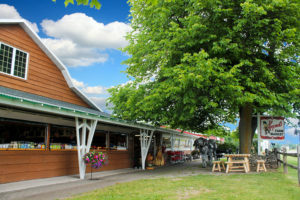 You can easily spend several hours at our farm market. The selection here is truly impressive. You can get fresh baked pies in the bakery section. Flavors include cherry, peach-berry, raspberry, strawberry-rhubarb, apple, caramel-apple walnut, and peach . Remember, pies are baked daily and advanced orders are welcome. Other bakery items include fresh donuts and scones. Try our sweet potato or pumpkin butter on some freshly baked bread – simply delicious! We are also famous for our 2 thru 12 year old aged Wisconsin Cheddar Cheese and have a wide selection of other cheeses as well. The deli section also includes fresh smoked whitefish and salmon, Nueske’s hams, bacon, smoked liver sausage,Old Wisconsin summer sausage.Try Kevin’s home made whole muscle beef jerky. Of course, we also have a nice selection of fresh fruits and vegetables available. You can also pick up a great bottle of Door County wine and don’t forget to try some of our signature items like dried cherry berry granola breakfast cereal, dried cherries, and chocolate covered dried cherries, or Karries homemade peanut brittle. 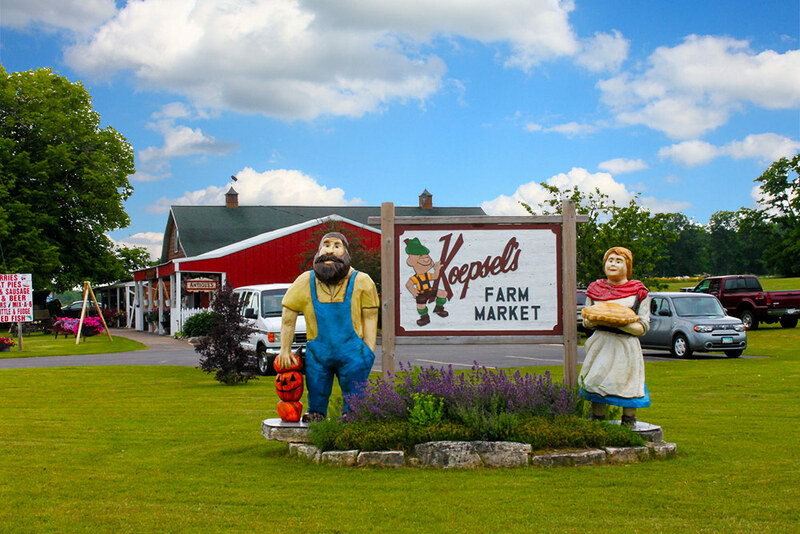 Whatever your taste buds, we are sure that a stop at our farm market is itself worth the trip to Door County.